Brazil has entered recession after official figures showed the country’s economy contracted by 1.9% between April and June compared with the previous three months. Analysts had expected a contraction, but the number was worse than expected. First quarter output was also revised down to show a 0.7%, rather than a 0.2%, contraction. The country, the seventh-largest economy in the world, has seen economic growth fall sharply in recent times. This is due in part to low commodity prices and sluggish global growth. High interest rates – currently 14.25% – have also affected consumer spending, an important element of Brazil’s economy, while this year, the government has introduced stringent austerity measures designed to tackle high levels of debt. Government spending, including on unemployment benefits, has fallen sharply, while taxes have risen. Transport, storage, postal services, financial services and insurance all saw falls in output. Compared with a year earlier, the economy as a whole shrank by 2.6%. The technical definition of a recession is two consecutive quarters of economic contraction. Most people have already been feeling the economic downturn long before today’s figures were out. Unemployment has risen rapidly, while inflation over 12 months is running above 9% – twice the government’s target. More worryingly, analysts believe growth might not return until 2017. 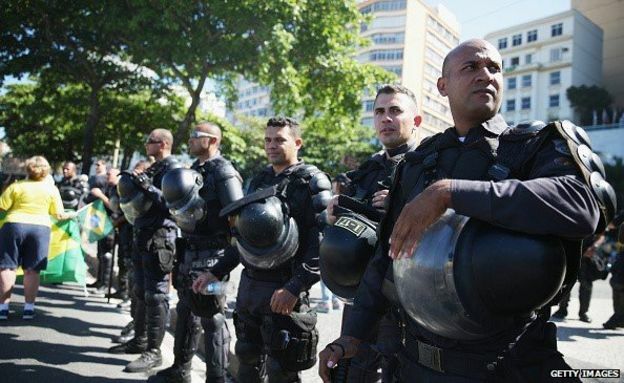 Brazilian authorities are trying to fix the economy with austerity measures, but the government is facing a political crisis and a rebellion of allied MPs who want to increase spending, rather than reform the economy. A corruption scandal has also hurt state oil giant Petrobras, responsible for a huge chunk of public investment. Now, as if things could not get any worse, there is uncertainty about how changes in the Chinese economy might affect commodity prices, which are vital to Brazil’s exports.